In an attempt at keeping my anxiety under control, I ended up with one of the worst dependencies I have ever experienced, even after being an alcoholic for ten years. Xanax brought me to my knees and kept me there for years, it destroyed me physically and emotionally, it took everything I had and left me a shell of a man. I have been fortunate to come out of the other side alive, but it still still important to care of those that are battling benzodiazepine dependence every single day. Some of them, like me, have gotten hooked, not by choice, but because they were prescribed medicine that they thought was going to help them and it ended up damaging their lives significantly. We must educate people of the dangers of prescription drugs, especially children and teenagers, as they are being bombarded by an influx of stimulus that make them believe that these types of drugs are not only fun, but also cool. Getting the word out there about the dangers of using Xanax and other benzodiazepines could save lives. In the video below you are going to see a man under the influence of more than 10mg of Xanax. That man is me, but just in the physical sense. In the mental sense, he is someone I don’t know, someone I don’t remember being. This man caused a lot of damage, and I have had to clean it all up with almost superhuman effort. It is embarassing to watch, and even more to share, but I feel is necessary to show others what one becomes at this level of addiction. 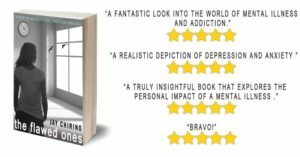 My novel, The Flawed Ones, explores addiction and mental illness in depth, not through the eyes of professionals, but of patients themselves. Leave your email here to get notified of global release and maybe win a free copy.